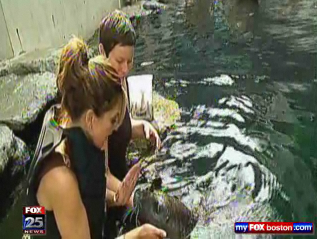 Marine mammal trainer Lindsay Jones introduced Reggae the harbor seal to Fox 25 meteorologist Cindy Fitzgibbon during a live television interview at the Aquarium this morning. As you'll see, Reggae humorously departed from the script a couple of times. While Cindy mentions that Reggae needs a Tic Tac, he actually does have great dental hygiene. Check out this blog post to learn how trainers take care of Reggae's teeth. 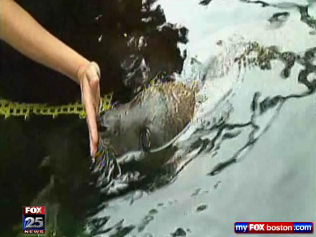 And if you want to get whiff of the harbor seals' breath, just like Cindy, check out our new Take a Dip with the Seals program!